18 amino acid peptide from near the amino terminus of human CRTH2. Synthetic peptide from human GPR44 / CRTH2. 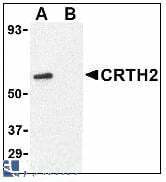 GPR44 / CRTH2 antibody was raised against synthetic peptide from human GPR44 / CRTH2. Short term 4 degree C, long term aliquot and store at -20 degree C, avoid freeze thaw cycles. Store undiluted. Small volumes of anti-GPR44 antibody vial(s) may occasionally become entrapped in the seal of the product vial during shipment and storage. If necessary, briefly centrifuge the vial on a tabletop centrifuge to dislodge any liquid in the container`s cap. Certain products may require to ship with dry ice and additional dry ice fee may apply. GPR44, also called CRTH2, is a Prostanoid Receptor that binds prostaglandin D2. PGD2 signals through CRTH2 to induce Th2, eosinophil, and basophil chemotaxis in a G-alpha(i) dependent manner. CRTH2 may play a role in mast cell-mediated immune responses such as those involved in allergic reactions. This receptor is upregulated in activated T helper-2 (Th2) cells, peripheral blood basophils, and eosinophils, but not in Th1 lineage cells. It may be a useful marker for Th2 and Tc2 cells. 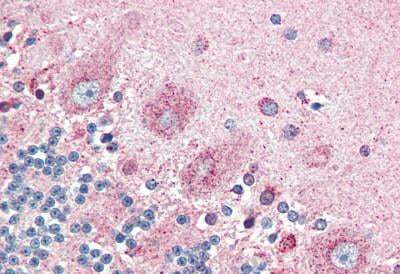 Anti-GPR44 / CRTH2 antibody IHC of human brain, cerebellum. Immunohistochemistry of formalin-fixed, paraffin-embedded tissue after heat-induced antigen retrieval. Antibody concentration 5 ug/ml. 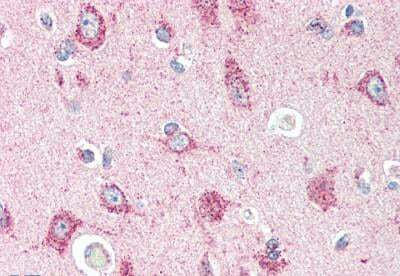 Anti-GPR44 / CRTH2 antibody IHC of human brain, cortex. Immunohistochemistry of formalin-fixed, paraffin-embedded tissue after heat-induced antigen retrieval. Antibody concentration 5 ug/ml. 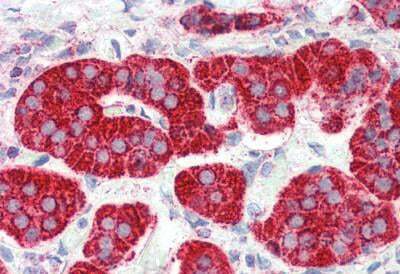 Anti-GPR44 / CRTH2 antibody IHC of human adrenal. Immunohistochemistry of formalin-fixed, paraffin-embedded tissue after heat-induced antigen retrieval. Antibody concentration 5 ug/ml. 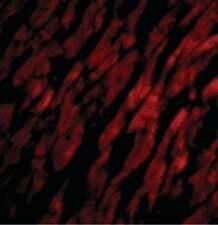 Immunofluorescence of CRTH2 in Human Heart cells with CRTH2 antibody at 20 ug/ml. Western blot of CRTH2 in Jurkat cell lysate with at 1 ug/ml in (A) the absence and (B) presence of blocking peptide. NCBI/Uniprot data below describe general gene information for GPR44. It may not necessarily be applicable to this product. GPR44: Receptor for prostaglandin D2 (PGD2). Coupled to the G(i)-protein. Receptor activation may result in pertussis toxin- sensitive decreases in cAMP levels and Ca(2+) mobilization. PI3K signaling is also implicated in mediating PTGDR2 effects. PGD2 induced receptor internalization. CRTH2 internalization can be regulated by diverse kinases such as, PKC, PKA, ADRBK1/GRK2, GPRK5/GRK5 and GRK6. Receptor activation is responsible, at least in part, in immune regulation and allergic/inflammation responses. Belongs to the G-protein coupled receptor 1 family. 1. Data indicate that in ulcerative colitis, DP2 receptor showed higher expression in neutrophils but lower in monocytes, and CRTH2 receptor was decreased in eosinophils, NK, and CD3(+) T cells but not in monocytes and CD3(+)/CD4(+) T cells.